In the Portsmouth & District League division one the race was on for second position. With Southsea Waverley having already won the title it was between Lee-on-the-Solent and Alexandra. Lee fell to a 23-shot away defeat at champions Waverley. Despite Lee winning on two rinks it was the 32-shot win for Matt Marchant’s Waverley rink that was decisive. 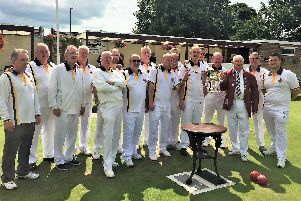 That meant if Alexandra beat Vospers they would claim second and they did it in style with an all rink 35-shot victory, led by the 19-shot win for Carl Baggott’s rink. In division two, the final game saw winners Cowplain finish at Gosport. It resulted in a 12-shot win for Gosport. 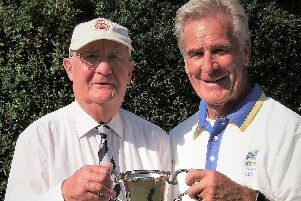 Ken Stanbury’s 14-shot win turned the match Gosport’s way, while for Cowplain, Peter Crowley’s three-shot win arrived despite dropping a maximum on the eighth end. Gosport’s victory meant they finished third. Division three winners College Park ended their season with a 10-shot win over co-tenants Phoenix. Mick Hall’s rink fought well for Phoenix but their 13-shot victory was overtaken by the 16-shot defeat to the College rink skipped by Roy Carter. Bridgemary finished second because Craig Rimmer’s rink got the two points they needed from their 15-shot defeat to Gas Social. Captain Derek Langford and his rink led for Gas. However, in their final game of the season, Gas couldn’t follow up that win as they fell to a 20-shot home defeat at the hands of Cosham Park. Cosham won on three rinks, led by the 12-shot win on Mike Heat’s rink.